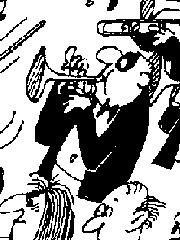 We have been entertaining Mid Sussex with high-quality classical music since 1979. We perform in May and November each year at St. Andrew’s Church Burgess Hill and in June in St. John’s Park. Do you play an instrument to a good standard? Would you like to play with a friendly bunch of dedicated people? Our 2019 Spring concert will take place on Saturday 11th May, starting 7.30pm. 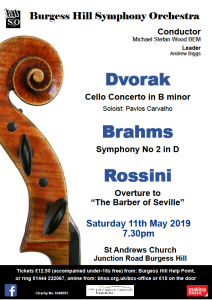 It will feature the Dvorak Cello Concerto, soloist Pavlos Carvalho, and Brahms Symphony no 2. 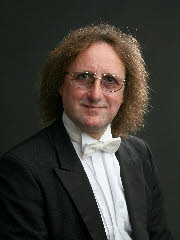 Mike Wood BEM has been conducting and directing the orchestra for more than 35 years. 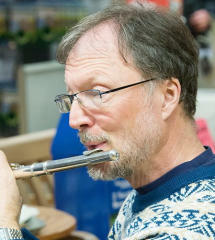 Richard Light, together with a dedicated committee and helpful members, run the orchestra like clockwork. The orchestra is made up of talented amateur players many whom live in Burgess Hill. Why not join us? Please do come to our next concert and bring your friends and family. Accompanied children have free entry. If you would like to help us even more please consider becoming a patron. Burgess Hill Symphony Orchestra shared a link. Burgess Hill Symphony Orchestra updated their cover photo.